When I was in Los Angeles recently for a press trip, Mazda was gracious enough to send me a Mazda3 so that I could get from LA to San Diego. All thoughts and opinions are my own. Collage shots and car selfie were taken by me. All other photos of the Mazda3 are courtesy of Mazda. My time with the Mazda3 i 4-door Touring was short (from Saturday evening to Monday morning), but I clocked a lot of hours driving the Southern California freeway and around town in San Diego while I had it, and it was easy to fall in love. 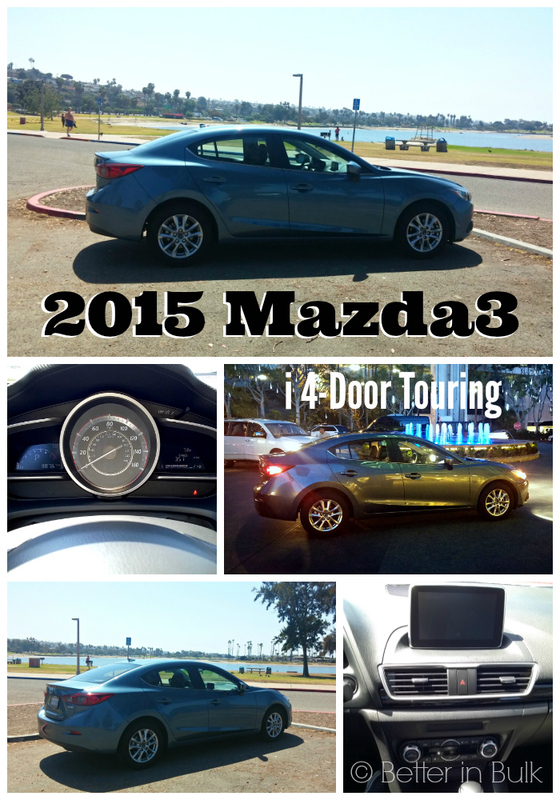 The Mazda3 is a slick-looking, smooth-driving, get-you-where-you-need-to-go kind of vehicle. My first impression of the car, when the hotel valet pulled it around to the front of the hotel for me, was that I loved the color (the car that I had a chance to drive was a gorgeous blue reflex mica with a black interior). The trunk had ample space for my luggage, and the driver’s seat had more than enough room for me. I was more than satisfied with my ride. I got in the car, hooked my phone up to charge via USB cord, found a good radio station (take a look at the enormous touch screen infotainment system! ), adjusted my mirrors, and was on my way south towards San Diego. It was easy to find the controls and features I needed to get on my way quickly. Maybe because I have driven a few Mazdas in the last few years, but this car just felt intuitive to me. The Mazda3 handled well in the night-time slow and then fast, stop and go LA traffic. Possibly my favorite thing about the Mazda3? When I got to my destination, I was able to zip right into (and later, out of) an insane, tight, wall-on-one-side parking spot. I never would have dared it with a bigger car, but the Mazda3 tackled the parking job like a champ. Frankly, it made ME look good. Perhaps one of the most appealing things about the Mazda3 is the sticker price. 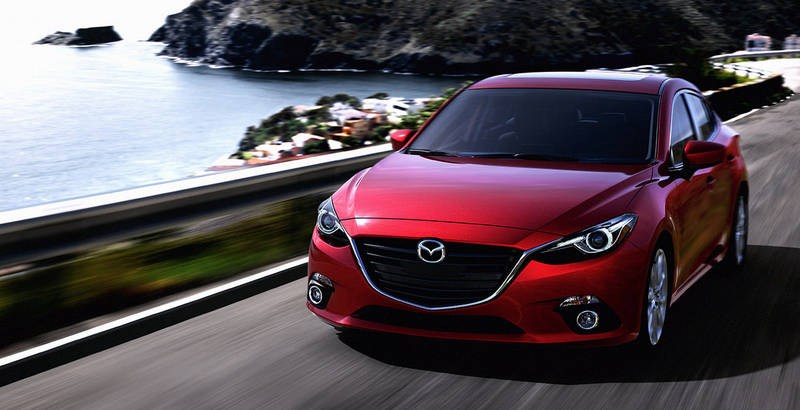 With an MSRP starting at $16,945, the 2015 Mazda3 is a very affordable car! The fuel efficiency adds to the affordability of the Mazda3; it has an EPA-estimated fuel efficiency rating of 29/41 mpg (city/highway), with an average of 34 miles per gallon. The other stats that stood out to me were the government safety ratings – the Mazda3 got an overall vehicle score of 5 out of 5 stars for frontal, side, and rollover impacts. 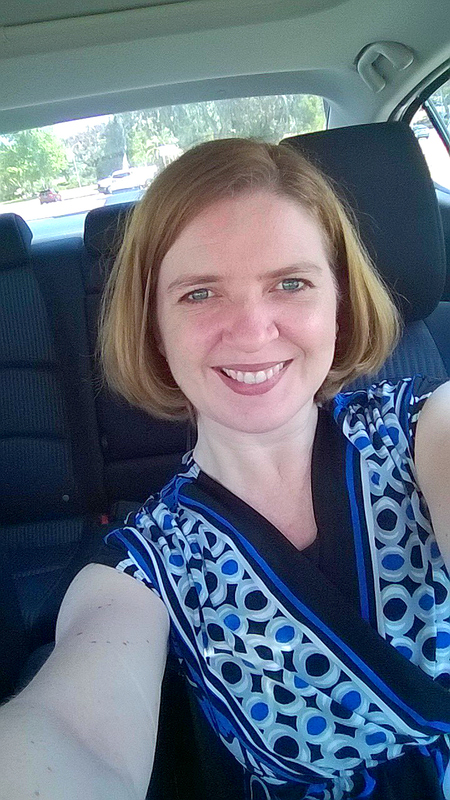 I feel so much better driving around in a car that has received top ratings for safety. Every time I get behind the wheel of a Mazda, I fall a little more in love with the brand. I love what Mazda has done with their cars in the past few years. Mazda has become one of our front runners for the new car search. What a nice looking ride! I like it in red. There are so many great available features. Some of my favorite are the heated front seats, Keyless Entry & Start System and rearview camera. What a sharp looking car! I love that it has a moon roof! This looks like an excellent vehicle with great features! I love the MPG it gets, too! I saw one of these Maza3 on the street parked, and I took a double take and thought that these cars look gorgeous! They are rated as a really good car and get great gas mileage. I would love to own one of these cars. Wow the available features for the Mazda3 look quite awesome and very impressive. I love the style of the car inside and out! The fuel efficiency, price, and the safety ratings is the most important for me as well. Awesome vehicle.